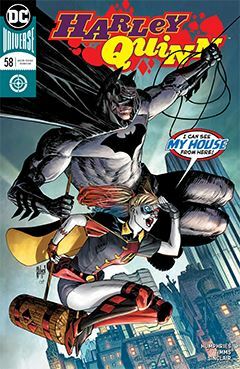 Harley is accused of murder, and ironically the person best suited to clear her is also the person best suited to hunter her down – the Batman. Ever one to get at the truth, he is slowly beginning to see her claims of innocence have the ring of truth to them. He reluctantly agrees that not everything is quite as it seems, and digs deeper. This is your basic “buddy cop” story, complete with whacked-out nut job and straight-laced ace detective characters we’ve seen in dozens of movies for decades. And while Batman & Harley are not a team we haven’t seen before, this is a refreshing – and more satisfying – version that presented in that questionable animated feature. Thankfully, your usual gang of idiots – Humphries, Timms, Sinclair and Sharpe – are in top form, sharing Harley’s adventures with her faithful audience. I am uncertain why Meredith Clatterbuck came along for all of a single page, but it’s not objectionable. Merely puzzling. I will admit, I sometimes wonder how long the Harley series will last. A reformed criminal trying to go straight, a lovable anti-hero with more than one screw loose seems like it would become tiresome after a while, but this is consistently one of DC’s better books.